Lasers are used in everything from weapons to barcode scanners. They have increased efficiency and advanced technology in numerous industries such as communications, manufacturing, and essentially every branch of science. Today’s post focuses on how lasers have changed dentistry. 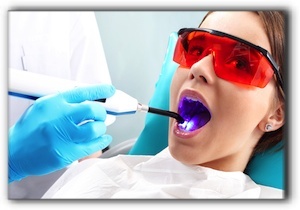 Lasers are now used in many technologically-advanced Texas dental practices for a broad range of care. Lasers allow dentists to be extremely precise when working on both tooth and gum tissue. Scott Mason, DDS, employs advanced dental technology with seasoned expertise to serve our valued patients. At Mason Cosmetic & Family Dentistry, we believe that every man, woman, and child deserves a beautiful smile and a lifetime of oral health. For questions about laser dentistry, implant restorations, implant-supported dentures or periodontal disease treatment, call 817-481-4717 today to schedule a consultation at Mason Cosmetic & Family Dentistry in Grapevine. We are located at 801 W Wall St.